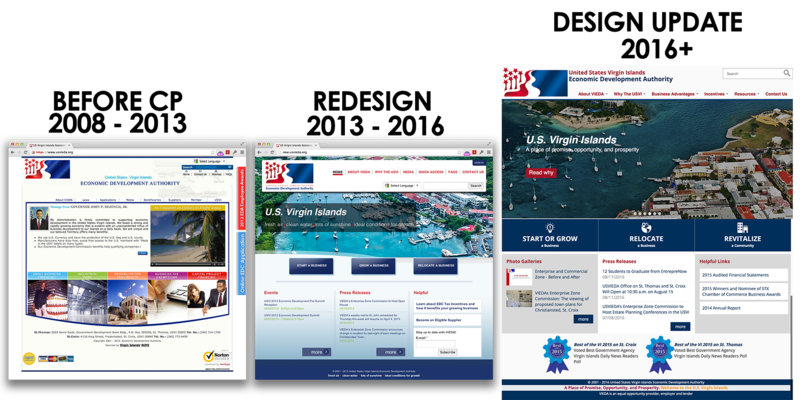 The U.S. Virgin Islands Economic Development Authority website receives a refresh! In 2013 CrucianPoint took over the Virgin Islands Economic Development Authority website and we set out to help VIEDA improve their online presence and ensure the world knows that the Virgin Islands is the best place to do business. We designed a new responsive, mobile friendly website that focused on the needs of the targeted audience and less on organizational structure. We made it easy for content to be quickly updated and information to be found. The website became an invaluable tool. The website also saw numerous tweaks and updates throughout the years like any good site should. Design patterns are always changing. What may be hip today may be flat tomorrow. In 2015 we evaluated the website and where the market was heading. Our design team took up the challenge of coming up with a new design that would be modern yet similar to the design users had come to love. The new design included a number of changes. We dropped the use of drop shadows and gradients, opting for a flatter look with bigger, bolder fonts. The light blue background became white. Related content moved up to the right side of the page. We also worked with the team to review all of the content and ensure that information is consistent throughout.